Creating knowledge, inspiring individuals and transforming business. Olin Business School of Washington University is an institution that is distinguished by being an industry leader in the field of research and education and by providing students knowledge delivered through a world-class faculty. The business school places an emphasis on intense analytical and critical-thinking skills, applied learning, global awareness and communication and collaboration skills that are necessary for the advancement of organisations in today’s global economy. Olin Business School has a smaller student body than normal which increases the level of interaction between peers and faculty members inside and outside of the classroom. The business school encourages students to develop key relationships and networks to create continuous personal and career opportunities. Olin Business School has a mission to create knowledge, inspire individuals and transform businesses. Olin holds the core values of free, open and disciplined intellectual inquiry, transformative learning, community and collaboration, integrity and responsibility and world-class results. They want to develop life-long learners who have a passion for creating new knowledge and sharing it with others. The business school is fully accredited by the AACSB and has been one of the country’s leading research-oriented business school for almost a decade. The Full-time MBA Programme gives students a comprehensive grounding in business fundamentals and helps develop their critical-thinking skills through framing questions, weighing alternatives, managing risks and solving complex business problems. The programme is two years long and focuses on leadership, career strategy and critical-thinking skills. Below is a diagram of the full-time MBA curriculum provided by Olin Business School. The programme includes a courses titled “Defining Moments: Lessons in Leadership and Character from the Top”. The course has notable leaders give guest lectures and speak at seminars to engage students and address important questions pertaining to the global economy. Students are approached with issues such as how leaders achieve superior business performance without sacrificing character or integrity, or what leaders do to create a culture of excellence. The Executive MBA Programme has a curriculum that ensures an absolute understanding of all the areas of management disciplines and focuses on the development of the ability to apply this newly learned knowledge in complex, unstructured business problems. Below is a diagram of the courses covered in year one. The Executive MBA programme is full-time and 20 months long. Classes meet three times a week during the day on Thursday through Saturday and students invest about 15 to 20 hours a week doing out-of-class activities, such as group study and homework. The programme also includes an international study trip to Shanghai, China, where students visit leading corporations and government agencies to get a first hand-look at foreign organisations. 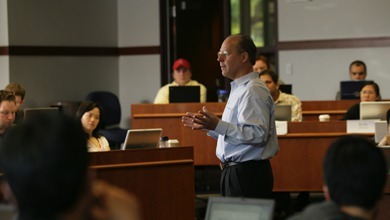 Olin Business School also offers Executive Education Programmes in open-enrollment and customised formats. The open-enrollment education seminars help executives gain knowledge and tools that can be applied to their careers immediately for mid-level and senior-level managers. Each seminar lasts about one to two days.